Having a graduate teacher in a nursery has only a limited impact on children’s attainment, new research suggests. In England the government wants more graduate staff in nurseries in a bid to boost children’s literacy and numeracy. But a study published by the London School of Economics (LSE) claims highly qualified staff had only a “tiny” effect on attainment. One early years group said the the report challenged “many of the assumptions” around current policy. The researchers, from the Centre for Economic Performance at LSE, Surrey University and University College London, looked at figures, drawn from the National Pupil Database, on about 1.8 million five-year-olds who started school in England between 2008 and 2011. These were the most recent figures available when the project began in 2012. 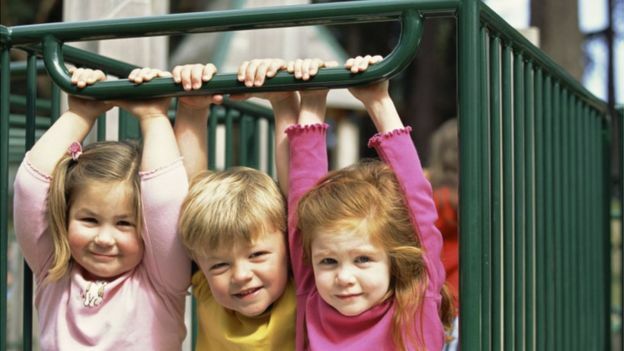 The researchers cross-referenced the children’s attainment at the end of their first year at school with information on the nurseries they had attended the previous year. The information revealed, that the children from nurseries with teachers qualified to degree level on the staff performed only slightly better than children who had not had access to qualified teachers at nursery. This amounted to having an overall teacher assessment score at the end of the reception year of just a third of a point higher, where the maximum points available is 117. The researchers also found only a minimal benefit for children who had attended nurseries rated outstanding by Ofsted, compared with those who had attended other nurseries. Lead author Dr Jo Blanden, senior lecturer in Economics at Surrey University, said: “Successive governments have focused on improving staff qualifications, based on the belief that these are important for children’s learning. “Our research finding that having a member of staff qualified to graduate level working in the nursery has only a tiny effect on children’s outcomes surprised us, given existing research that finds well-qualified staff have higher quality interactions with children. Neil Leitch, chief executive of the Pre-School Learning Alliance, the largest voluntary sector provider of early years education in England, hoped the report would help “end the widespread misconception that private and voluntary providers are of lower quality than maintained settings simply because they are less likely to employ graduate staff”. “We have long argued that quality early years provision is about more than just staff qualifications,” said Mr Leitch. The LSE study contradicts research last year from Save the Children which said it was crucial for every nursery in England to have a qualified early years teacher. 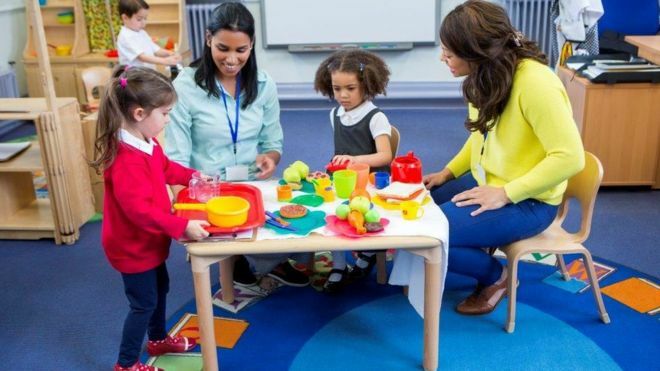 The charity’s UK poverty director, Gareth Jenkins, said it was still very much of the view that qualified nursery teachers made a huge difference. “A wide body of evidence shows that children who don’t have access to these teachers are more likely to start school behind their peers, and that children who start behind are four times more likely to still be behind by the time they start secondary school – something that can have a huge impact on the rest of their lives,” said Mr Jenkins. A Department for Education spokesman said the government’s early education strategy was working, with a record number of nurseries, pre-schools and childminders rated “good” or “outstanding” and the proportion of children reaching the expected learning and development continuing to rise. “Latest results show the attainment gap between disadvantaged pupils and their counterparts is narrowing,” said the spokesman.